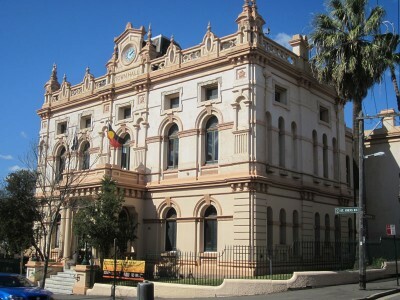 The Town Hall is Glebe’s grandest civic building and the centre of its political, social and cultural life. The Town Hall is itself a major Victorian embellishment. Prior to 1880, Glebe Council, one of the first three suburban boroughs to be established in Sydney in 1859, had met at the University Hotel. 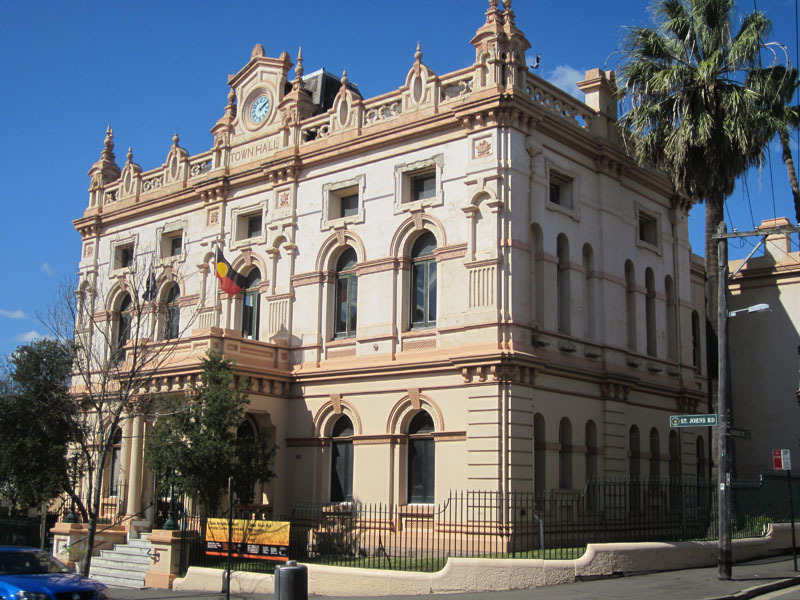 Glebe Town Hall (1880) established St Johns Road as the civic centre of Glebe. In quick succession the Colonial Architect, James Barnet, added the Court House, Police Station and Post Office. Although the Town Hall site was quite restricted, the architect, Ambrose Thornley Jnr, (who also designed Bellevue) managed to squeeze in quite a lot, including a large hall upstairs and a residence for the Town Clerk facing Lodge Street. Elaborate facades were fashionable at the time, and Thornley’s has been variously described as French Second Empire and Beaux Arts. It certainly includes a wealth of detail, as can be seen from the stained glass and tiled columned portico. (Unfortunately at this time the Town Hall is undergoing extensive repair and renovation by the heritage architects Tonkin, Zulaikha. Once this is completed this section will be amended to include some notes on the interior, which is well worth a visit, and may be the only interior available on the walk). Cross St Johns Road at the pedestrian crossing and look back toward the Town Hall. To the right is the Nag’s Head (formerly the Town Hall) Hotel where the users of the Town Hall could quench their thirst following the many and diverse meetings and functions at the Town Hall, which had been a vital political, social and cultural centre since it was built. To the left is the curious row known as the Matchbox Terraces, the earliest and smallest terrace built in Glebe (c.1850). They are not only small but very plain. The Town Hall is on the border of the Glebe Estate, the area of public housing that extends between Parramatta and St Johns Roads, and also on the border between Glebe and Forest Lodge, not really a separate suburb but a largely physically distinct area named after a large early 19th century estate on Bridge Road. Walk east past the Matchbox Terrace to Purves Street and turn left. This street, not much bigger than a lane, leads through to Reuss Street, both lined with tiny terraces. Across Reuss Street is Hewitt Avenue, a pedestrian lane (really a drainage easement) that runs alongside Reussdale and the Abbey. Bernard and Kate Smith, The Architectural Character of Glebe, University Co-operative Bookshop, Sydney (1973), pp99-101.